Kofi Annan has been showered with credentials so much so that he became the ‘outstanding choice’ to broker peace in Syria. When that choice is made by the US there is little for us to imagine in whose interest the agenda has been set. Annan’s accolades include post of UN Secretary General, winning the Nobel Peace Prize in 2001 and include countless awards, positions and honorary degrees that obviously outshine his failures and bias. It is obvious that the same cartel of UN heads and officials are being pulled out of hats and recirculated to head UN appointed inquiries with the obvious outcome virtually sealed for the targeted nations. There is little point in nations crying foul for a criminal syndicate such as the UN funded by criminals is hardly likely to listen to reason. Next best option is for nations to start pulling out of the UN and Russia and China needs to start considering this option with entire Third World likely to back them. Annan’s associations with global plutocracy deny him the right to be given or to accept roles as UN envoys or to head UN international investigations. In 1994, Annan as Head of UN peace keeping operations chose to ignore the warnings of General Romeo Dallaire, Commander of the UN peace keeping force in Rwanda. Dallaire even wrote a book – Shake Hands with the Devil: The Failure of Humanity in Rwanda alleging that Annan had been unreceptive to calls for UN troops to be sent to quell the genocide of Rwanda’s Tutsi minority. Yet, the same man who did nothing to stop Rwanda genocide goes on to say years later “U.N. Security Council do nothing meaningful to stop the” slaughter “and instead engage in crafting empty proposals that amounted to a minuet of death” and gets the plum role of being name peace envoy to Syria. When Brookings Institute, a US foreign policy think tank prepares a blue print and declares “An alternative is for diplomatic efforts to focus first on how to end the violence and how to gain humanitarian access, as is being done under Annan’s leadership. This may lead to the creation of safe-havens and humanitarian corridors, which would have to be backed by limited military power. This would, of course, fall short of U.S. goals for Syria and could preserve Assad in power. From that starting point, however, it is possible that a broad coalition with the appropriate international mandate could add further coercive action to its efforts.” (Assessing Options for Regime Change), our doubts are erased – Kofi Annan was appointed as peace envoy simply to buy time for the Western-backed militants to get their act together against President Assad. Thus Annan’s Syria failure was actually a planned failure and an appointment simply to buy time and certainly questions the modus operandi of peace talks and ceasefires promoted during other armed conflicts as well. The Syrian failure also surfaces the statistics made available by the Syrian Observatory for Human Rights (SOHR) which declared that 7636 people had died 2 months before Annan took over the peace role, but 4 ½ months after he took over the deaths jumped to 17,000. Where does this leave Kofi Annan and his peace role but he walks away with $7.5 as envoy fees? There is another dimension to Annan’s soft approach and that returns to the oil for food program in which his son was an associate smuggling Iraqi oil through Syria. According to Annan he didn’t know his won was working for Cotecna or that the company had a contract with the UN though at the inquiry he recalled he had a meeting with the CEO of Cotecna twice! 1997-2006, as UN Chief Annan was in charge of overseeing the Oil-for-Food relief program for Iraq and became one of the most corrupt failures in which his own son was involved. Annan’s own choice Benon Sevan was accused by the UN’s own inquiry of pocketing money from the oil-for-food program but Sevan was never charged and instead was allowed to flee to Cyprus. Paul Volcker head of the UN probe declared that even Annan ‘fell short of the standards that the UNO should strive to maintain’. A question to be answered is why despite failures, Annan is able to rise up diplomatic circles and lead humanitarian efforts into further failure unless that is the objective of his appointment? There are further questions of how far Annan has compromised his integrity. 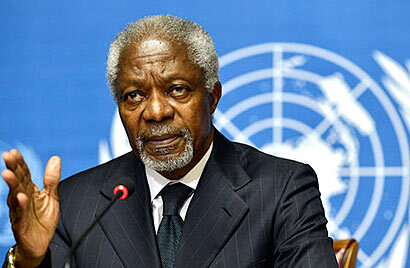 Annan is a member of JP Morgan’s International Council. If so that makes him aligned to Western-interests. JPMorgan Chase is the biggest bank in the world with over $4 trillion in assets. It is a major political force in the world, integrated within the network of global elites who make up the plutocratic ruling class. Of the 55 key people of JPMorgan, 13 hold positions in the Council of Foreign Relations, 8 hold positions in the World Economic Forum, 5 hold positions in the Trilateral Commission another international thinktank which merged into JPMorgan by David Rockefeller one of the 13 global banking families that control and own the world’s wealth. JP Morgan is also represented in the US Federal Reserve, the Citigroup, Bilderbergs, Group of Thirty, Sara Lee Corporation, Harvard, Rolls Royce, American Express, American International Group, Centre for Strategic and International Studies, Coca-Cola Company, National Bank of Kuwait Advisory Group, China-US exchange foundation, Mitsubishi, Carlyle Group, IMF and US-China Business Council just to name a few. According to Andrew Gavin Marshall, an independent researcher based in Montreal, Canada, JPMorgan Chase has an International Council which provides advice to the bank’s leadership on economic, political and social trends across various regions and around the world. The International Council is chaired by Tony Blair, former Prime Minister of the UK, who also sits as an adviser to Zurich Financial. The Council includes Khalid A. Al-Falih, the President and CEO of Saudi Aramco (Saudi Arabian Oil Company), the world’s largest oil company, who also sits on the International Business Council of the World Economic Forum. Annan is also a member of Chairman of the Alliance for a Green Revolution in Africa (AGRA), AGRA is a lobby funded by the Bill Gates and Rockefeller Foundations to promote the dissemination of GMO’s produced by Monsanto, DuPont, Dow, Syngenta and others. the use of non-reproductible GMO crops keeps farmers under the thumb of their suppliers and introduces a new form of human exploitation. Annan is also on the boards of the United Nations Foundation, the World Economic Forum, and he is a member of the Global Board of Advisors of the Council on Foreign Relations. Annan is a trustee of the International Crisis Group (2012) which makes him linked to George Soros, Kenneth Adelman, Zbigniew Brzezinski, Richard Armitage and their neo-conservative corporate agenda. The International Crisis Group is funded by Carnegie Corporation, George Soros’s Open Society Institute, Rockefeller Brothers Fund, Sigrid Rausing Trust, British Petroleum, Chevron, Shell, Staoil, Kimberly-Clark Corporation, Morgan Stanley, Humanity United, NPI Capital, Hunt Alternatives Fund, Jewish World Watch and Deutsche Bank Group. 2006 – Inter Press Service, International Achievement Award for Annan’s lasting contributions to peace, security and development. How and What is LASTING is a good question. Annan has received honorary doctorates from universities that include UN Mandated University, Lund University, National University of Ireland, Technische Universitat Dresden, Howard University, Comenius University in Bratislava, University of Notre Dame, Seton Hall University, Brown University, Free University of Berlin, Tilburg University, University of Alcala, Northwestern University, University of Pittsburgh, Ghent University, Carleton University, University of Ottawa, University of Pennsylvania, George Washington University, University of Tokyo, Georgetown University, University of St. Gallen (Switzeland), Princeton University, Kings College, London, Glasgow Caledonian University and possibly scores more. Thierry Meyssan, writing for the Global Research in April 2, 2012 claims Annan is handpicked and trained by Ford Foundation (unofficial US foreign policy advocate) and CIA. The basis for this allegation is how he had been headhunted by the Ford Foundation under the ‘young leaders program and had then been put for a course at Harvard University. His complete studies had been funded by the Ford Foundation (Economics at Macalester College Minnesota, International Relations at the Graduate Institute of International Studies in Geneva). He was then put into the WHO, next appointed to the Economic Commission for Africa, UN peace keeping, then put as Director of personnel with the UNHCR and was introduced to and married Nane Lagergren the niece of Raol Wallenberg and well connected to the Rothschild banksters. Annan’s rise was thus accelerated wherein he became Assistant Secretary General in charge of HRM and later but in charge of peace keeping under UNSG Boutros-Ghali. With US vetoing the reappointment of Boutros-Ghali, Annan was placed as the UNSG in January 1997. One of Annan’s first duties was to organize retreats for UN ambassadors funded by the Rockefellers where a new blueprint was laid out. Annan’s initiatives like Global Compact, Agenda 21 were all in line with the greater objectives of the corporate family to which he by marriage belonged. Theirry Meyssan argues that the Global Compact was a deviation of the universally accepted logic that international law serves the common good. What Annan was promoting was the good of only the Anglo-Americans. The Annan doctrine introduced under the Responsibility to Protect theme was nothing but the right to intervene and has been used to legalize occupation of sovereign nations. Libya was one such victim. Rumor has it that Navi Pillai is fishing for Annan to head her feud against Sri Lanka and the influential chain to which Annan belongs makes him the perfect choice for her to carry out her vendetta which by association of Annan merges with the global plutocracy aim to encircle China which is why Eelam is said to be a Christian prerogative in the present context and explains why the West is chirping the human rights for Tamil and devolution for Tamil theme. Bias and impartiality lack of ethics and good governance are jargon meant only for Third World consumption and Annan would probably be appointed for a new role as lead investigator irrespective of the chargesheets against him for all the appointments are done by the same people and it is the same people carrying out the appointments as well. All is within the family. Kofi Annan belonging to a network of people that form the global plutocracy is simply part of the Transnational Capitalist Class. In becoming one of ‘their men’ he has no moral right to claim to be ‘independent’ ‘unbiased’ impartial and to take up any role as mediator or heading any international investigation on human rights or whatever else the UN that functions to the dictates of this same capitalist class orders him to do. But, Annan will probably land the role and Navi Pillai with all her bias will probably go higher places within the UN system as well. Therefore, the best option is for Third World nations to stop being subservient to these mechanizations and decide to exit the UN altogether.